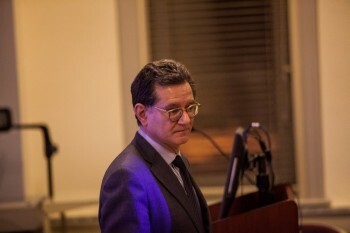 Carlos Castresana giving the first of his three President's Social Justice Series lectures. The prosecutor who helped put away dictators such as Chile's General Augusto Pinochet and Argentina's General Jorge Videla has been teaching two classes and lecturing on campus all semester. Carlos Castresana has played many roles over the course of his illustrious 35-year legal career. He's been a prosecutor for the Supreme Court of Spain, a judge, a defense attorney, and a law professor. He's indicted high-ranking officials, such as former Italian Prime Minister Silnvio Berlusconi, and served as a representative of the Spanish Union of Progressive Prosecutors, for which he helped craft the legal strategy that led to the arrest of dictators such as Chile's General Augusto Pinochet and Argentina's General Jorge Videla. And he was appointed by the United Nations as Commissioner Against Impunity in Guatemala, where he oversaw the capture of more than 150 gangsters, drug traffickers, and high-ranking officials, including former President Alfonso Portillo. But now he can add a new role to the long list: Haverford College visiting professor. Since January, Castresana has been living on campus and teaching two classes:“Transitional Justice: The Politics of Accountability,” which he co-teaches with Political Science Professor Anita Isaacs, and“International Criminal Justice.” He has also been giving a series of lectures this spring as part of the President's Social Justice Series. (The final talk, â€œSailing in Unchartered Waters,” will be held Tuesday, April 24, at 5:30 p.m.) He spoke with us about his time at Haverford, learning from his students, and his career accomplishments. Haverford College: How are your classes going? HC: How has teaching at Haverford been different than your other university teaching assignments? CC: It is much more challenging. In Spain, I was at a public university. There were a very massive number of students, so there could not be a lot of personal interactions between the students and the professor. In California, [at the University of San Francisco], it was a better ratio, but it was a university school of law and the students were very clearly directed to pass the bar and get their professional licenses to work as a lawyer. But in this case, being undergraduates, the students have more interest, more curiosity. They are like sponges. It is very challenging for me because they are very good students, so they are good researchers, they take their assignments seriously, they do very good work themselves. And it is a challenge for me to do my best in order to get at their level, which is really high. HC: You've said that you're here not just to teach, but to learn, so what have you learned here at Haverford? CC: Basically this: being open. It is a very important thing at Haverfordâ€”especially in [my larger, 25-person] class. It is like the UN. You've got people from every continent, most of them are American citizens, but many of [their families] came one or two generations ago from Asia, from Europe, from Latin America, so it is like a small General Assembly, and there can be a crossing of different points of view. People of the Middle East compare their points of view with people from the deep American Midwest, and are put together these with people from India and people from Latin Americaâ€”it's a perfect combination for brainstorming. We say we are now a family of 26 and this is an extremely profitable exercise for everyone, to put together so many different sensibilities of different cultures and study how can we be more useful using the tools of international justice. It is enormously important. And in my smaller class, [it is like] I am one of the students. I am learning very much from Professor Isaacs because I am closer to the model of lecturing professor, but she is a master in provoking discussion, debate, exchange of ideas. HC: You have prosecuted all kinds of people, but is it different when you prosecute a head of state? CC: Absolutely, because supposedly equality before the law is a basic principle in any domestic or international system, but equality has to be built. Equality does not exist in real life. There are societies that are rich or poor, that have different races, different religions, minorities, and people are discriminated against. But when you come to the court of justice, all these inequalities should not [pass through] the door. Inside the court, we should all be treated equally. But when you're the head of state, you have privileges, you have immunities, you have influences, you have factual powers that protect you. So the challenge for the prosecutor is to be able to get the court to treat the head of the state as any other citizen. HC: That must be difficult when dealing with differences in international and domestic laws though? CC: This is another very important and difficult challenge that I try to explain to my students because, yes, you have simple cases and you use only domestic law, it is more or less easy. Everything is written, everything is in the book, you go to the criminal code and all the responses are there. You need just to apply it to the facts of the case. But when you deal with these much more complicated issues, it is like a cocktail because nothing is in one book. So you are dealing with domestic law, but also regional lawâ€”maybe the European System of Human Rights, or maybe the Inter-American System, or maybe the African Union rulesâ€”and obviously, then you need to go to global instruments, maybe the International Criminal Court or the International Covenant of Civil and Political Rights, which is the Bill of Rights on the universal level. â€¦ I will have to put it all together and persuade the tribunal, because if they don't understand, they will acquit, always. So, as a prosecutor, you need to be a professor too. HC: What are you most proud of in your career? CC: There are two critical moments in my career that in many ways changed my life. One is the prosecution of General Pinochet, which was a turning point for all the global community. The fact that a head of state could be found accountable for international crimes without victor justiceâ€”without having been previously defeatedâ€”was the most difficult part. â€¦ And the other unforgettable experience was in Guatemala, because it was a very dangerous environment, [and] a very unprotected civilian population. I came to a place where the impunity in common crimes, in very serious crimesâ€”we are talking about homicideâ€”was 98%. Yes, of every 100 crimes, only two were solved. You can imagine the kind of safety and security you enjoyed there. So basically, it was an impossible mission. I used to say they hired me because probably Tom Cruise was not available. But after three years of hard work in a dangerous environment with a lot of people supporting us and with very bad guys trying to boycott everything we were doingâ€¦ my team and I were able to bring to court seven high-impact cases and get seven convictions. So it was a very clear message for the society in Guatemala, a demonstration that they could enjoy justice. Even in developing countriesâ€”very conflicted with a lot of poverty and inequalityâ€”can you also enjoy the protection of the judiciary. HC: What's up next for you? CC: I have three years of leave [available to me from] the Supreme Court in Spain, so I am just beginning to spend this time. I don't know what's next. I think that is a very good spirit, a very good approach. You need to be open to possibilities. As long as you have youth and enthusiasm and ability, you should be open to consider different options. So, where can I be most helpful? One of the basic ideas in my life that I learned from my parents is [that you should be concerned with] the kind of world you receive and the kind of world you are leaving to your children, and to try to do the best in your capacities to improve it. Maybe you can't fix everything, but you can improve it. So [I'm] working to leave my children a better world than the one my parents and I had to live in.